Ever see a magician take a pack of playing cards, shuffle the deck, wave his wand over the deck, and make the Ace of Spades rise into the air? Pretty mysterious. How about I wave my wand over my blog, and make the blog feed URL rise into your browser? You've seen a BlogList wizard - you add a blog to your bloglist. Just type in the blog URL, and it pops up the feed. How did it do that? The answer isn't hard to see, just look in the template header, for the live blog. You can find the feed URL, by viewing the template header. Use View - "Page Source" with the blog displayed in your browser, or use an HTTP text proxy, to examine the blog code. There, you will find the auto discovery feed URL. You won't see anything from the template source, in "Page Elements" - "Edit HTML". You have to look at the live, rendered HTML. Here's what you may see, in "Edit HTML". If your template is missing that line of code, no magic for you. 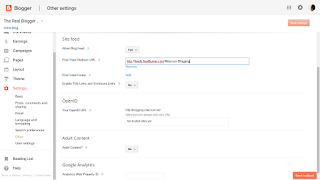 Enable the blog feeds from the dashboard Settings page. Now, consider possible additional details which some blogs have. Both a custom domain redirect, and a custom feed (ala FeedBurner) redirect, may provide more challenge. You can't change the native feed URL, without a feed redirector. Also note that the URL shown in the header displays the native URL of the feed - and reflects the value of the internal feed URL variable. If you change this header record, that won't change the internal variable. To change the URL, you need to setup a redirected feed (such as a FeedBurner feed) - then use the Post Feed Redirect setting, to point to the redirected feed. Set the "Post Feed Redirect URL", to point to the redirected feed. You do know, I hope, that if your blog is private, it will not publish a feed. And finally, be aware that not all online services accept a redirected feed. 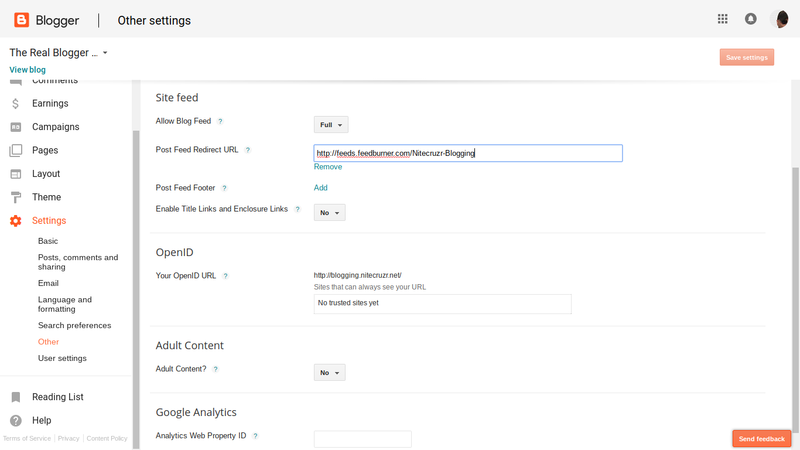 Any blog with a standard header will provide the feed URL, as auto discovery. But once you understand the details, you can Follow any blog which has the auto discovery feed URLs, defined in the blog header. Just use the "Add" wizard in "Reading list", in your dashboard - and provide the URL of the blog. Thank you for your tip... That is very useful!!! But I know that for some blogs Blogger generate all this link-type records and for some it did not generate them. Yes, that's a very good idea just add these link type records by yourself in template, but more interesting question is What I need to add to template to make Blogger generate these links for me? Just found an answer on my previous question. To make Blogger to generate all these if we use <b:include data='blog' name='all-head-content'/> in head-part. Yeah I have friends with this problem on a LOT of their stuff. I think I'm going to link them to this page so they can fix it. Diagnosing blog feed problems involves some dialogue, back and forth. That's a lot easier to do, using a forum conversation, than using blog comments. Forum discussions can be formatted much better too. Why not post in Blogger Help Forum: Get Help with an Issue, so I can help you a lot easier?